“Quality management” means a specific approach and a particular attention to product creation, and to the mechanisms to be adopted within each production phase. The purpose of this methodology is to monitor production, processes and design procedures, in order to ensure that these fall within the quality standards. The quality assessment procedures are based on specific rules and milestones that define the procedures for carrying out the project activities, dictating indications on the preparation of documents, instructions for internal cooperation and timing for reviews. Periodic and planned meetings : these are formal events involving the contractor’s representative (project manager), and the client’s manager, with the aim of defining the bases of the project and planning the future actions to be undertaken. Technical meetings convened by the project manager who decides who should deal with it. For this action, ARCADIA SIT proposes a monitoring of the web system that allows updating and checking each phase as timing, work progress, technical and administrative documentation. The reporting of the project is the basis for the management and administrative evaluation of the same, this activity involves the collection and dissemination of information regarding the way in which resources are used to achieve the objectives set, and the assessment of the progress of the project. project, based on the work plan. The implementation of the system is based on a web-based OpenERP platform, which allows an immediate view of the states and communication, through a simple and structured interface, this platform can be consulted and modified by any authorized user, in compliance with the authorizations that determine which data and functions are accessible to each user, also allows, for each activity, to specify which documents must be produced, who must produce them, their acceptance or request for revision. By integrating the workflow platform with our WebGIS product, it is possible to monitor the progress of data production geographically, and with the advantage of GIS functions, among the main ones are the management of map data, the display of maps and themes, cartographic navigation, spatial analysis and support of an easy and concise geographical representation of the project status. 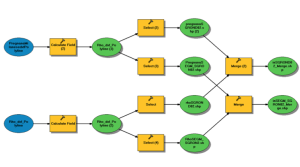 In OpenERP, a project is represented by a series of activities to be completed, the process setting, managed by the WorkFlow Manager platform, is realized with the logic of nested processes, providing a main flow of activities, each of which consists of a series of specific steps, the projects have a tree structure that can be subdivided into phases and sub-phases, as shown in the following image. Analytical accounts examine the past activities of the company, while the role of Project Management is the planning of future activities. Although there is a close link between the two, (as if a project has been planned and then completed through OpenERP), there are still two different concepts, each of which contributes specifically to a flexible work process. The administrator can define a new project, give it a name and insert it in a hierarchy as the child of a parent project, assigning a project manager to it, the general duration of the work is also established, signaling the start date and end date. and on the “Administration tab” the information on Scheduled time and Time spent on the project is displayed, based on the work performed. For any object in Open ERP there is a session that allows the user to attach external documents. OpenERP will index documents such as .doc, .pdf, .sxw and .odt, so you can easily search for their content. Many documents have their own workflow and also participate in cross-functional processes. Unlike most other ERP systems and classic statistics-based systems, OpenERP provides dashboards for all system users, not just for managers and accountants. Each user can have his own Dashboards, adapted to specific needs, so as to be able to carry out activities effectively, for example, a developer who uses Project Dashboard can view detailed statistics and information such as a list of open activities, activities delegated to he and an analysis of the progress of the relevant projects, the Dashboards are dynamic and allowing the user to easily navigate around the entire information base. The user can set the working time in the project file and retrieve a Gantt chart of the same from “Activity”. The system then calculates a project plan for faster delivery, using the order of activities and the necessary work time. The geodatabase may be necessary to perform some inspections and repair, standardization and harmonization activities in order to make data consistent with each other and improve their quality. To this end, operational procedures, specific tests and tools for monitoring and supporting data quality have been designed, based on the use of the latest generation GIS, in compliance with national and European standards. For the control of geometry and topology we have developed in Python language, a series of procedures parameterized to detect errors, produce reports and in some cases intervene with automatisms for corrections.